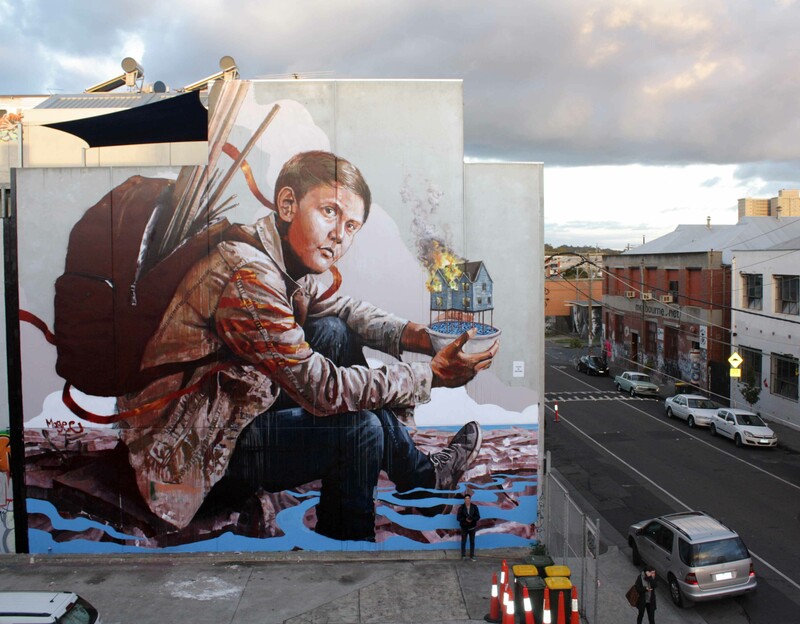 Besides having one of the greatest names of all time, street artist Fintan Magee has been putting his hometown of Brisbane, Australia on the map. At least when it comes to street art. Lauded as Australia’s answer to Banksy, the young artist’s similarities with the renowned English artist pretty much stop at the lazy comparison. Magee, after all, is an entirely different kind of artist. So much so that Banksy and Magee couldn’t be more different. Magee’s work is full of colour and life, unlike Banksy’s famously colourless stencils, but they do share a love of humour, although for different purposes. For Banksy, the humour is spiky, aimed directly at political institutions and powers that create a world of oppression and privilege. For Magee, the humour is about smiles and laughter, an intrigue that comes from looking at art as art and not as criticism. And with that idea in mind, Magee sets out to make street art the isn’t necessarily bearing the shrewd agenda of Banksy’s work, but instead something that people can get behind to break down the stigma around graffiti and street art in general. And by doing so, he hopes to give himself and his fellow artists opportunity in the future. Fans of Magee’s work can see it all over Brisbane, naturally, but it’s also been creeping out around the country, including his much-loved Sidney and Toowoomba. But no matter where he goes, the art remains beautiful and captivating, a true pieces of art that seek to enrich and bring smiles, from knowing smirks to outright guffaws, to the people of Australia. He may be as popular in his home country as Banksy, but that’s where the comparison of these two incredible artists stops, and that’s a good thing for expanding the idea of what street art and graffiti can do. When most people think of street art, they think of only a few materials. Well, that’s not true, most people think of one single medium, paint, when it comes to art found in public spaces. It is, after all, the most widely used material, but ever since graffiti started, people have been experimenting with the physical means they use to communicate and make art. 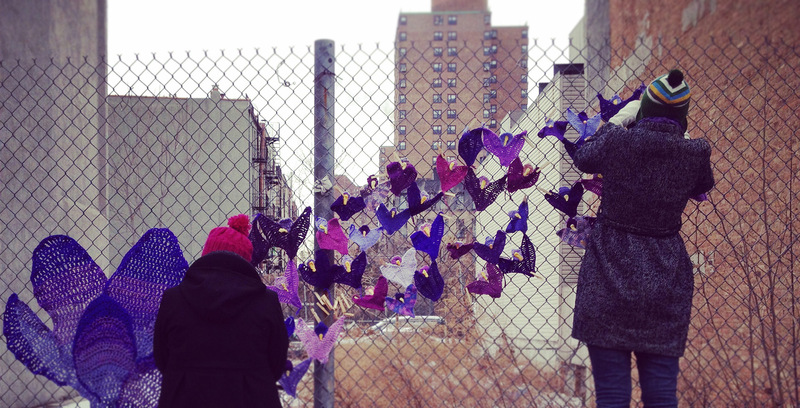 And one such artist has made a splash in East Harlem, with what some may consider the least “street” of materials: knitted yarn. Naomi RAG (the “Rag” stands for “Random Acts of Generosity”) is a New York-based artist who’s mastered the art of “yarnbombing,” where colourful yarns are spread out in a public space not unlike painted graffiti to form certain shapes and looks. Except where paint has only a limited set of places it can go, yarnbombs can end up almost anywhere, from chainlink fences to light posts. She started doing it back in England a few years ago before moving to New York, where she has now set up shop and puts up a new piece every month. The process is long and time-consuming, by the looks of her scope and vision, which probably take a long time to dye and knit into the right shapes. But the results are universally spectacular. Each of Naomi’s yarnbombs are colourful, creative, and made to spread a positive message: a tree knitted with LOVE into the pattern, a brightly-coloured display of flowers, or anything else that at once beautifies and uplifts. They are all focused on beauty and eye-pleasing work that can bring a bit of literal colour to a passerby’s day. But it isn’t just the message that makes these pieces so inspiring, it’s Naomi’s use of form and space. From cozies that cover an entire tree’s trunk to elaborate setups on chainlink fences, Naomi’s work spreads out and takes over these spaces in new and interesting ways. Spaces that usually collect garbage or are ignored by other street artists are given a colourful vivacity that inspires and lifts the look of the area. And especially in East Harlem, where gentrification has caused a lot of problems for street artists, this blend of new materials and classic “bombing” is creative and, well, a little cozy. What Naomi RAG’s work accomplishes is not just a positive message or unique scope with space and materials, it shows that street art can accomplish a lot of different tasks using many different materials. In that way, all street art is reflexive, aware of its cultural roots, and is constantly coming up with ways to differentiate and create new experiences. For Naomi RAG, that is threefold: through materials, through positive messages, and finally through the use of non-traditional space for the projects. As many skiers and snowboarders know, there is little better than the look of fresh powder. Being at the top of a mountain and seeing the beautiful snowscape is at once peaceful and brilliant. It makes you feel alive, and it connects you to something that feels old and untouched. Standing at the top of that mountain before skiing down is truly a moment of serenity and beauty. One that artist Simon Beck knows all too well. For the past decade, Simon Beck has been traipsing around the snow-covered mountains of the Northern Hemisphere, adding his own little dash of beauty to these already incredible places. It started out as a hobby but is now his full-time career, making beautiful snowy art pieces at ski hills and mountains around the world. Instead of paint, brushes, and scaffolding, the tools of most muralists, Beck uses only three simple devices for his snowy patterns: a pair of snowshoes, a drawing, and a compass. Everything else is done by memory and counting paces. The drawings usually require a lot of walking, up to 25 miles in many instances. Unlike the rude drawings of teenagers, Beck’s snow art is intricate and beautiful, displaying a love of design and complex patterns rather than messages or simple shapes. An engineer by trade, almost all of Beck’s snowscapes are mathematically inspired. The reason is personal choice, but also ease of work. According to Beck, they allow him to “get to drawing much sooner. You are just following simple rules. You don’t have to keep referring to a diagram. You can do it from memory. And they just look the best.” Popular designs he uses include the Koch snowflake, the Sierpinski triangle and a version of the Mandelbrot set. While Beck predominantly does snowscapes, his art has expanded to sand and, surprisingly, a clothing line based on his intricate shapes. The sand is a logical extension of his art, but also comes with unique challenges. Beck says the flatness makes the work much easier since it isn’t as deep or labour-intensive as snow, but that there is one aspect that makes it more frustrating: the tide. Since water on beaches has a regular tendency to wash away his art, Beck has to select beaches that have sand rarely touched by the actual water. Simon Beck’s awesome sand and snow art shows that street art can exist a long ways away from the actual street, and can use the materials around to create beautiful art. By using only a compass and snowshoes, Beck’s art is eco-friendly and beautiful, contributing the beauty of the natural world without impacting its longevity. We’re all familiar with street art and graffiti, and most people who follow this blog know about the many ways people create street art. Paint, ash, and even salt have all been used to make art, and much of it showcased right here. But all of those involve putting something onto something else: paint sprayed onto walls, salt arranged delicately on a museum floor. But there’s also the art of reverse graffiti, the removal of stains and marks to create an image through absence. It’s been around since cave paintings. we have handprints of artists in reverse, the paint washed over and their hands removed. At its most primitive, reverse graffiti is someone writing “Wash Me” on a dusty car in a parking garage, but at its most clever and incredible, it can take up entire walls, or even the inside of a glass bottle. That’s where artist Jim Dingilian comes in. 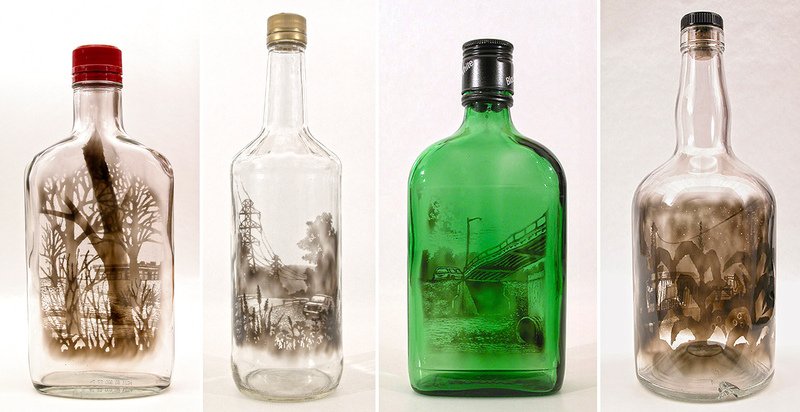 The New York artist has essentially collapsed the idea of reverse graffiti and the world of bottle art into something beautiful, intricate, and actually not bad for the litter problem of New York City. He later claimed his primary concern was a parking issue. Dingilian’s work is more than found object art, it is a blend of what we take for granted with what is always there, hiding in plain sight only if we allow it. And with pieces like his glass containers, we can see that the distance between litter and art, the apparently “unruly” and the “civilized elite” is not only ridiculous, but one and the same.